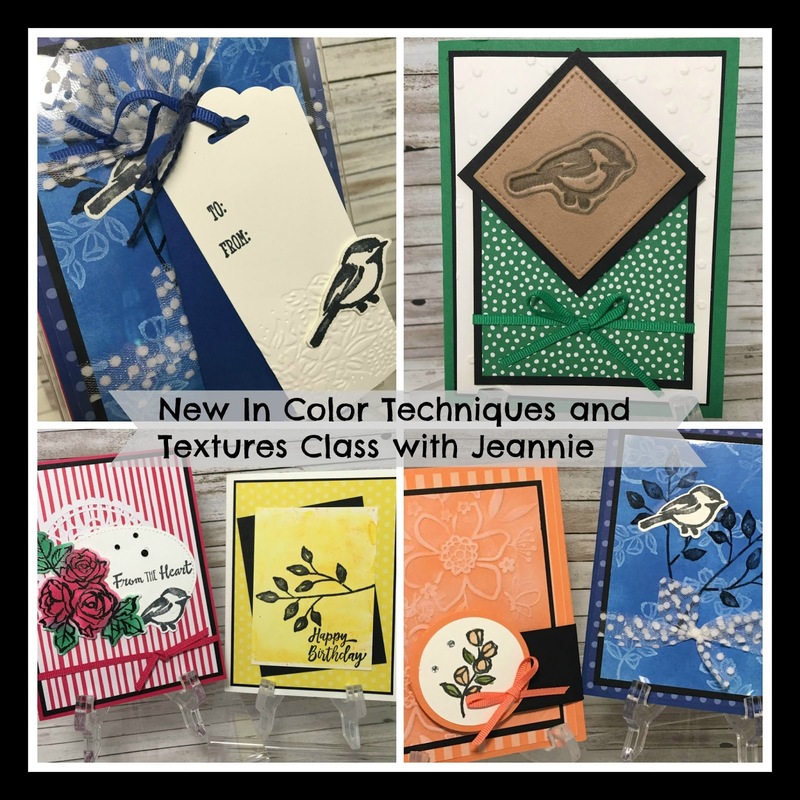 Saturday, June 16th, 2018 marked our 4th Creative Crafting Escapes (with Jeannie and Marilyn) since last June and boy, did we have fun again! Many have said it was our best yet! I wanted to share some pictures of the card class I taught as well as a few pictures I remembered to take before or during the event! This is the "cover photo" for my In Color Techniques and Textures class: I did emboss-resist with VersaMark, embossing with the heat gun and embossing powder, then coloring in with sponge daubers before cutting out with the Big Shot, fun foam (a new technique for ALL of us! 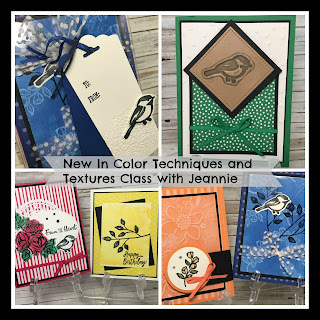 ), embossing with an embossing folder, then sponging to accent the embossed, and Brusho (the yellow card). All of the cards fit snugly in our acetate box, and then we tied on a cute little tag. If you haven't guessed yet, the stamp set featured was Petal Palette. I gave everyone 1 yard each of the new In Color 1/8" Grosgrain ribbons, 1 yard of the 5/8" Whisper White polka dot tulle, 1/2 package of the In Color 6"x6" Designer Paper Stack (I pre-cut the pieces they needed for class), plus 1 package of the new Faceted Dots. In addition, I pre-cut and scored all of the cardstock pieces that they needed for the class. I hope to do a quick tutorial in the next day or two, showing you how to do the Fun Foam card -- it's very neat! This is a picture of my Up Line and Stamping Partner, Marilyn SanClemente -- you'll laugh when I tell you she was playing the game too ... because she forgot to make up the Answer Key ahead of time! Too funny!! Check out the Giveaways! We gave (8) 1/2 sheets of colored cardstock, a full sheet of Whisper White cardstock, pearlized doilies, and a 6"x12" piece of each of the Share What You Love designer papers. One of our other demonstrators, Margaret, created a display of Apron cards using the Apron of Love stamp set (not pictured, but that was also in the giveaway as part of their entry fee.) -- she created one card for every month of the year!! Yikes!! I forgot to get a picture of another giveaway -- Margaret also designed 4 simple cards using the Apron of Love stamp set that guests could create during the afternoon ... yep, MORE cardstock and ideas!! Since I didn't get too many pictures of the room set up, this is one of the views of a couple of the tables before everyone got there on Saturday morning -- we tried to give everyone plenty of space to work! I took this picture at lunch -- not too many times when we all had a chance to sit together and visit with 4 classes through the day! I say this every time ... next time I'll specifically ask someone to take a few pictures!! Such a fun day! I got 28,000 steps by the end of the day!! Phew!! And guess what ... we've already started registering guests for September!! Yay! !